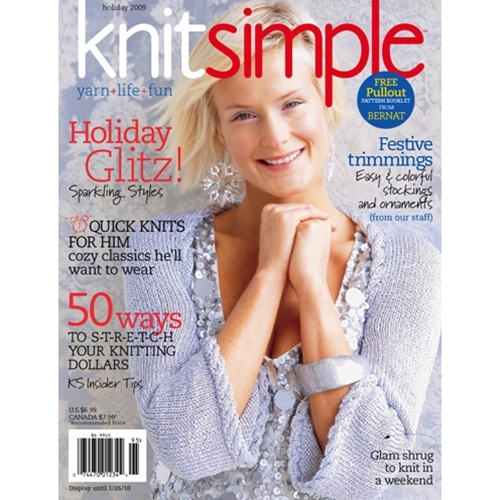 Tinsel’s got nothing on these sparkly party knits. Plus, step-by-step tips. Little girls love festive red cardis specially embellished for the season. Red and white infuse scarf and throw with candy-cane sweetness. A handsome cardigan and pleasing pullover–both for men–are just as charming disarmed, as vests. Nothing is merrier or brighter in the workplace than a burst of color. Get set for Santa’s trip down the chimney with six spectacular stockings. Matched gift sets suited specifically for mom, dad, bro and sis. Plenty of great knit-knacks, plus knitting goes to school with Scholastic. Along with color curriculum from Kristin Nicholas and tricks of the trade from Lily Chin, Cathy Carron shows a whole lot of Hattitude. Ornaments from the KS staff to decorate your tree stitchily. Cost-cutting advice will save you much more than a stitch in time. Nicky Epstein's spa cloths—great last-minute gifts—boast seasonal accents.